When women play football (or soccer in U.S.), the individual interruptions, for instance for substitutions or to cheer a goal, are a lot shorter than when men play. 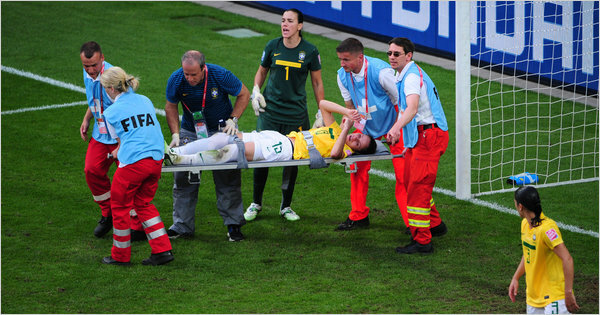 In particular after injuries men remain on the ground significantly longer. This is what sports scientists discovered after analyzing 56 football games and evaluating the place, time and duration of every single interruption of the game.Interruptions are frequent in football: Football players (m/f) spend on average 38 percent of the total game time not chasing the ball. This was established by sports scientists from the Chair of Training Science and Sports Informatics at TUM in a study of 56 football games. In some games, the interruptions took up as much as 53% of the time, thus exceeding the duration of the actual sports activity. In sum, interruptions in men’s and women’s football are about the same. The individual interruptions, though, are significantly longer in men’s football. Cheering a goal, for instance, takes almost a full minute with men, while women only cheer half as long. At 45 seconds, substitutions in men’s football take almost 10 seconds longer than in women’s football. Particularly striking are the differences in the duration of injury interruptions — men remain on the ground 30 seconds longer. Overall, when women play, interruptions are more frequent, but the game generally resumes much faster than with men. Prof. Martin Lames’s team of researchers at the Chair of Training Science and Sports Informatics is using the method of “Case-by-Case Analysis of Game Interruptions,” which they developed, to cast light on how football games are structured. The results will help the scientists determine how football players (m/f) might best prepare for a game. The comparison between women’s and men’s football was actually the byproduct of a research project. The Women’s World Cup, which just started in Germany, will show whether or not these differences will persist in light of the fact that women’s football is enjoying increasing numbers of spectators and growing media attention. ‹ Sport science and chances – what would you do if you knew the chances to win?